Throughout the two days at Expo 2018, there were more than 200 hours of speeches, presentations and activities, and almost 5,000 people visited. Health and Care Innovation Expo is more than just a two-day event – Expo is about year-round collaborative learning. 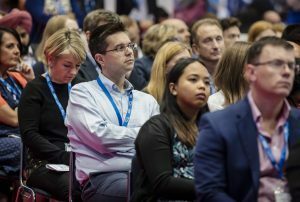 Every year at Expo, more than 90% of our delegates tell us they will share what they have learned from the event with their colleagues, and half tell us they will make changes in their own teams and organisations as a result of attending the event. We also ran a series of Expo 2018 webinars, giving further opportunities to share best practice from across health and social care. To make it as easy as possible for you to share your Expo 2018 learning, we are sharing all available 2018 resources from the event. To view transcripts and presentations from the 2018 event, please download the Expo 2018 app or email us at england.expo@nhs.net.